It is quite difficult to go somewhere and leave your pet at home, all by itself. We are well aware of that and so were the developers of this brilliant app that we’re about to show you. 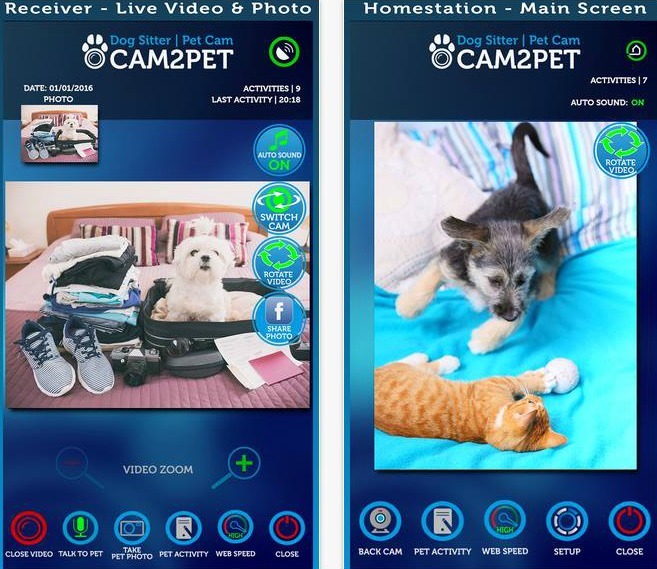 We present to you Cam2Pet, the first and the only pet cam app available for both Android and iOS users. It is brought to us by the developer team App runner KG who made it with great graphics and friendly user interface. The Cam2Pet is simple to configure, you only have to complete 3 easy steps. So, first you have to choose your home station and activate it. It can be a desktop or a tablet. After that, you have to activate the receiver on your smartphone and in the end, tap on the button to open the video and there you have it, your own pet cam in the palm of your hand. There are many integrated features, like live video stream, 100MB webspace for you to administrate the photos and videos taken with it, live video stream, and the videos are with high resolution, the audios with high quality and they’re crystal clear, etc. Take as many pictures of your pet with the app and record as many videos as you like, then share it with your Facebook friends and let them know about Cam2Pet. The app is available in three versions: free, gold and premium. The last two are ad-free and with more features for you and your pet. Get it now from Google Play or from the App Store!